April 7, 2018 - We were back in beautiful Beverly Hills, CA today for a tour of the iconic Greystone Mansion. The Mansion, also known as the Doheny Mansion, is a Tudor Revival mansion on a 18 acre landscaped estate that has distinctive formal English gardens. The 55-room former residence has over 46,000 sq. ft. of living area and its construction was completed in 1928. The house and grounds are often used in filmmaking and television production. The house's descending staircase is one of the most famous sets in Hollywood. The 2007 film There Will Be Blood, which was loosely based on the life of Edward Doheny, used the downstairs two lane bowling alley for the murder scene in the film. 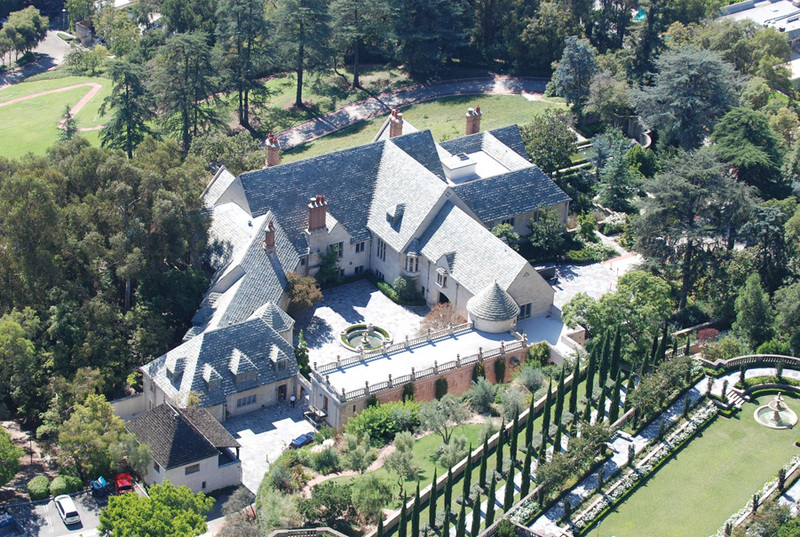 For other films and television shows filmed at the Mansion, click here. Edward Laurence Doheny (August 10, 1856 – September 8, 1935) was an American oil tycoon who, in 1892, drilled the first successful oil well in the Los Angeles City Oil Field. His success set off a petroleum boom in Southern California, and made him a fortune when, in 1902, he sold his properties. He subsequently went on to develop oil fields in Mexico and Venezuela, which holdings became known as the Pan American Petroleum & Transport Company, one of the largest oil companies in the world in the 1920s. Doheny was implicated in the Teapot Dome Scandal and accused of offering a $100,000 bribe to United States Secretary of the Interior Albert Fall. Doheny was twice acquitted of offering the bribe, but Fall was convicted of accepting it. Doheny Sr. built this property for his son Edward "Ned" Doheny Jr., his wife Lucy and their five children. Ned was murdered in the house, in fact a lot of people died in the house and it's pretty much haunted. The stonework of the building's exterior reminded us of Quebec City, Canada. This is Ranger John, one of our two guides. The tour lasted over two hours and most of the time was spent inside the house. All the wallpaper is original to the house when it opened in 1928. This pattern is hand painted. The bathrooms are over the top! This built-in weight scale still works. The butler's pantry has been used as a doctor's office and a morgue in many movies, as shown by our second guide Ci. This is the potter's kitchen, where cut flower arrangements were put together. What a sink! There are many hallways and secret passageways throughout the house. This isn't a linen closet, it's a linen room. This is the gun room and notice the game kitchen through the door on the right. Game shot on the grounds was prepared here on a blood draining counter. More beautiful 1928 wallpaper in Lucy's dressing room closet. The wood paneled pool room has the original 1928 pool table. And hidden behind the paneling is a private speakeasy, hosted by Ranger John. If you saw the movie There Will be Blood, you'll remember this bowling alley. It's an incredible house and it made for an incredible adventure.